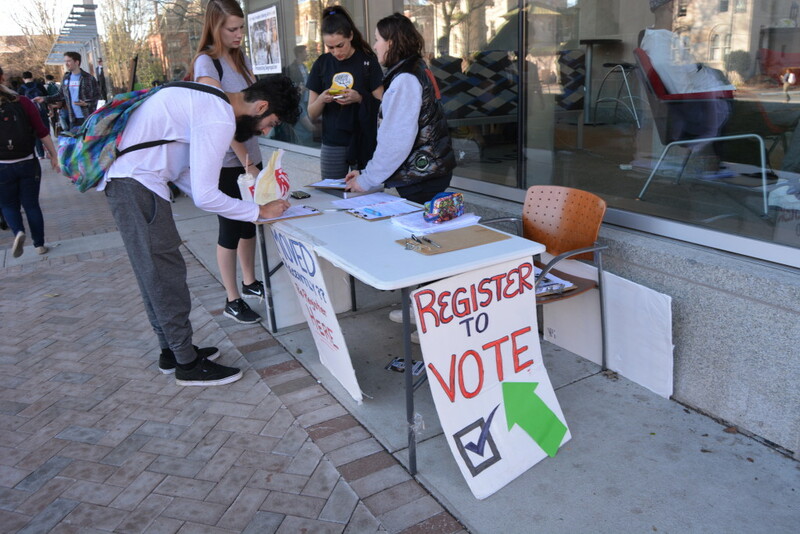 College students, who are part of the young voters age-range, 18 to 24, register to vote on Virginia Commonwealth’s campus. RICHMOND, Va. (02-29-16) — As the 2016 presidential election approaches, presidential candidates and their campaign staff are targeting specific groups to win these groups’ votes. Researchers from the Pew Research Center and The Center for American Progress have developed projections of demographic groups candidates should turn their attention to because of their potential influence in the election’s outcome. The Rothenberg & Gonzalez Report, a non-partisan newsletter covering Presidential politics, shows that Colorado, Florida, Ohio, and Virginia are states that could vote either way. These states’ electoral votes add up to 69 points and are split down the middle with voting Democrat or Republican. These are the swing states that candidates will need to give their attention. Alex Theodoridis is an assistant professor at the University of California, Merced who studies American political behavior and voters. He says the voters to watch for on the democratic side are minorities, women, and young voters. Theodoridis says the country will witness minority voters have a say in the process on the democratic side for the first time, despite the fact that Iowa and New Hampshire are predominantly white. He adds that Latinos are a fast growing minority group that is not fully behind either party, and their population numbers are geographically focused. It would be difficult for a candidate to focus on states with high a Latino population like Florida or Arizona successfully without appealing to Latino voters. The Latino population will increase by nearly 7 million people with a 12 percent change between 2015 and 2020, according to the U.S. Census Bureau (Table 12.) This makes them the fastest growing ethnic group in the country. Theodoridis says the Latino vote is seen as a vote that can also be “up for grabs,” aside from the swing states. Laura Ramirez Drain, founder of the Hispanic Professional Women’s Association in Washington D.C., says 80 to 90 percent of Latinos follow conservative principles, and she expects the Latino vote to go right, but it is not guaranteed. According to Drain, women are the backbone and have a large influence on their families, and if women choose to vote, they will represent their families. As shown in the U.S. Census Bureau Table A-1., 1980 was the first year women had a higher voter rate than men with 59,400 compared 59,100. Every year since, except 1982, women have led men in voter rates. She adds that women are more likely than men to be anti-war, support state government that provides social security, welfare and healthcare for the citizens, and also support more regulations on the economy. The U.S. Census Bureau reports that young people who were born between 1982 and 2000 make up more than one quarter of the nation’s population with about 83 million people. Now is the time for young people to take advantage of their influence, according to Adam Fletcher, Program Director of the Freechild Project in Olympia, Wa. He says they are vital for raising both voter turnout and civic engagement in general by encouraging their family and community members to vote. “What we really see is the power of young people on a consistent basis move these elections forward, but it’s like a double-edged sword in our media that says in one hand you aren’t voting, but on the other hand admits that every campaign they’re this gigantic force that are moving these politicians into office,” Fletcher said. He adds that young voters need to be able to identify what works and doesn’t work for them in the political process and be able to determine what they would do differently as a result. Abby Kiesa, youth coordinator and researcher at CIRCLE in Washington, D.C., who has conducted experiments with ways to get young people to vote, says each state needs to have people who are willing to reach out to young people to convince them to cast a ballot. “One of things that’s really problematic about the way our political institutions operate right now is that young people are more likely to be engaged in formal political life if they have a more formal education,” Kiesa said. According to Kiesa, there are resources in the community and organizations that work with teachers to inform students and give them the opportunity to engage in issues that are relevant to their lives, making politics more relatable and less intimidating for young voters. The data provided in this story are pertinent in supporting the given statistics and information from the sources provided in the story. When examining or discussing demographics, it is necessary to have statistics and data to be more precise in presenting the information. The data tables that come from the U.S. Census Bureau include population numbers, data from voting reports, and a press release that further support population growth of groups listed in the story. In addition to that, the Rothenberg & Gonzalez Report, shows the current status of the electoral votes per state and how that can potentially contribute to, or deter the direction of the Electoral College. All of this information together further specifies why these projections of have been made about these influential voter groups.